Catfish tastes amazing but will not end up on your dinner table without a fight. To conquer this resistance and reel in monster catfish, you will need the right fishing equipment. It also helps to know where this fish species dwells, what it loves to eat, and what attracts it to the bait. We have prepared a short guide, on how to catch catfish, to help you have a successful expedition. Whether you are new to the game or have been there for years, the advice provided in this post will ensure you don’t leave your catfish fishing spot with an empty cooler. Different catfish species thrive in different habitats but in general, catfish can be found in fast rivers, shallow lakes, and man-made structures. Sometimes you will find these creatures in areas where water current hits a huge rock or log like near riverbanks. If you are fishing during the day, your lucky spots will be muddy water areas, river bends, and covered spots like deep weed edges and stationary logs. Nighttime could also be an excellent time to dip your fishing rod in the water for a prowling cat. Shorelines, flats, points, weedy areas, and bars will be the best places to look, as these are the spots where these fish species go to hunt for food at night. Catfish are more active in warm water than cold. So the best time to prepare your gear for fishing will be in spring when the water levels have risen and the temperature of water has gone up to about 50˚. However, there are places where catfish fishing season will start earlier and in others, water will only warm up toward the beginning of summer. To know the best time of the year for fishing these water monsters in your region, keep checking the weather forecasts. Also, when possible link up with other anglers, who knows, you might just discover a new fishing spot for catfish in your area that only a few people knew existed. And even when the weather is extremely cold, you don’t have to pause. Some catfish species like Blue catfish are active during winter, so if you know how to ice fish, grab some augers, fishing line and rod, and get going. Fishing in the morning yields more fruits than later in the day or dark hours. How to catch catfish successfully will highly depend on how long before sunrise you start your angling. Most fish tend to feed few hours before dawn so you are likely to have a more effective catch than when there is full sun, when the fish are less active. As we mentioned earlier, you will need the right gear for this activity. You don’t want to be in a position where your equipment is not working properly or is either too light or too heavy to get the job done. Match your gear to the size of catfish you intend to catch. For monster cats, get heavy action rods, strong lines, and reels with an excellent drag. Smaller catfish however, will be more fun to pull from the water with lighter bait casting or spinning rods. 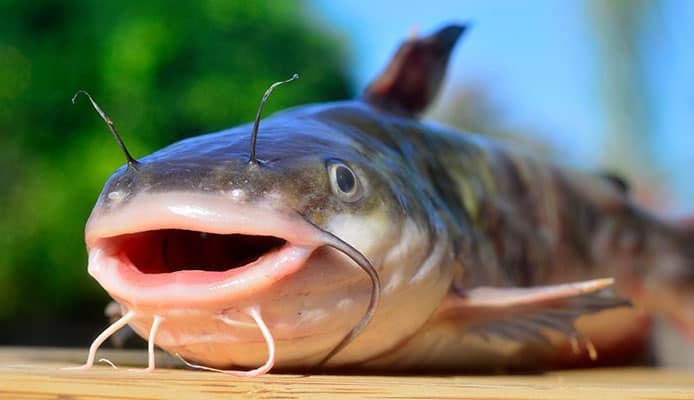 The truth is, catfish will munch just about anything that enters their mouth – live minnows, liver, crickets, earthworms, mealworms and any other natural foods that tastes good in their mouths. There are also artificial baits that mold around hooks and are quite popular in catfish angling. Whichever option you decide to go for, your choice will be highly dependent on the size of fish you intend to catch. For small catfish, earthworms, and minnows will do the job but if you are eyeing the bigger fish, a 7-inch shad or bream will be your best bet. Catching a 50-pound fish with a night crawler is not even practical. Small pieces of bait like these will just get stolen from the hook. If this is your first catfish expedition, bring different types of lures, as you may not be sure what size of fish you will find. Catfish in your region may be used to some specific type of bait too, so having several options to choose from will get you standing a higher chance of not going back home empty handed. If you reside in North America, for instance, where channel catfish is the most common type of catfish species, you may want to try cut lures of goldeye, herring, shad, and other baitfish. These release an oil-like substance that attracts channel catfish. You can also experiment with uncut baitfish although these won’t release any oils. However, they will be more appealing to the fish because they are alive. Try both types of bait and see which one works better for you. You can also try crawfish although this one is commonly used by catfish anglers in the southern regions. 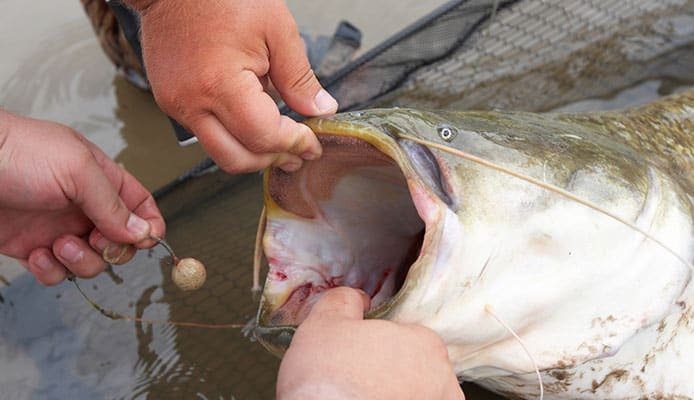 Some artificial catfish lures claim to have a secret ingredient that makes the fish go gaga. Give these a try too and see if they really are that magical. However, pro anglers argue that live baits catch more and better catfish than dead baits. If you have a good spot for cat fishing, the right equipment, and the perfect bait, you can start your fishing. Just set up your gear, dip your rod into the water, and wait for the fish to bite. Pay close attention to the water around you and the weight of your rod. A giant catfish might get the water bubbling as it approaches the bait. Feel if your rod gets any heavier as this is a sign that you just hooked something. Keep moving. If you have stayed in one spot for more than 30 minutes and nothing is happening, check to see if the bait is still there. May be some fish stole it and that’s why you haven’t caught anything. If you still got the bait on, move to a different spot and cast your line. Just like any fish species, catfish keep on moving and so should you. Once the fish has taken a bite, reel it in quickly and place it on your fishing net. Make sure the net is partially dipped in water so the fish doesn’t die. Examine your catch to see if it meets the size allowed for taking fish home in your region. If it doesn’t, you will have to set it free. If you will be keeping the fish, fill a bucket with clean water and dip it in so you can prepare it later for storage or for dinner. Catfish are fun to catch and can be found almost anywhere. How to catch catfish however depends on the fishing equipment you have and the time of the year you choose to go fishing. The best time to give catfish angling a try is during spring, although some species are still active during winter. Your bait will also play a role in determining how successful your catfish expedition will be. Catfish love live baits. Get smaller baits for small sized cats and larger baits for the monsters. Just remember to store these in a bait cooler to keep them fresh before you go, as it’s very unlikely that catfish will eat stale fish pieces.